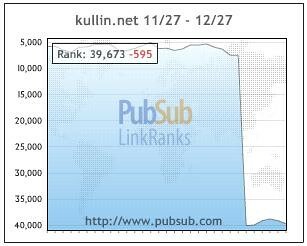 I revealed on Dec 22 that PubSub potentially had made some changes in their LinkRanks application that had a serious negative effect on many sites’ ranking. My blog dropped 32,544 spots in one day, down from 7,495. Well, I didn’t get any answer directly from PubSub, but their CEO made a comment in Trevor Cook’s follow up post. PubSub’s CTO Bob Wyman also posted a comment on his own blog. The effect of this improvement in the granularity of the LinkRank calculation will take about 10 days to be fully felt. We need to wait for the impact of old links to fade out of the system and for the impact of more recent links to dominate. Once this settles out, it will be fascinating to try to figure out why some sites went up in LinkRank and others went down. In any case, we’ll have more accurate and thus more useful numbers to work with in the future. Please keep sending suggestions on how to improve LinkRanks — and please forgive what will be inevitable “turmoil” in the numbers as we continue to increase the accuracy and granularity of reporting in the future. So it seems that the new ranking is more accurate than the previous one, but taken into consideration the drastic changes in rankings, the application maybe was launched too soon. On Nov 18 Ismail said in a press release that “We now feel the system is ready for use by consumers and professionals across the country, and the world”. But as a professional you would want the data from PubSub to be reliable and if changes are made you would expect some kind of information. That information should be clearly visible on the web site, not only on a blog that most people are not aware of. PubSub have yet not published any information on their site about the changes to LinkRanks.